Today is day 3 of our 30 day Negativty fast and Gratitude Feast. I am hearing moaning and groaning from friends and family near and far that it is tough to stay positive. Without a doubt, it is a challenging task. Since we all have three days under our belt it is fitting to understanding that there are some perquisites to successfully fasting from negativity. One of them is understanding the anatomy of the mouth. Paraphrasing the dictionary Britannica.com, the mouth is the orifice through which food and air enter the body. The mouth opens to the outside at the lips and empties into the throat at the rear; its boundaries are defined by the lips, cheeks, hard and soft palates, and glottis. It is composed of a vestibule, open space, between the cheeks and the teeth, and a lower chamber filled by the tongue. 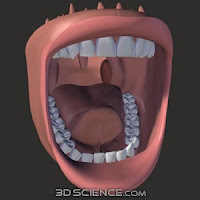 In addition to its primary role in the intake and initial digestion of food, the mouth and its structures are essential in humans to the formation of speech. I like verse 34 in the NASB version which says, "For the mouth speaks out of that which fills the heart." The origin of our words comes from our hearts. Words are like fruit and our hearts are like fruit trees. Our hearts can be evil or good, and in addition they can be filled with evil or good. Evil words come from an evil heart. Good words come from a good heart. Our identification to others is often formed by the fruit we bear or the words we say. Our words shape others judgement of us. They can reveal the judgement of innocence or the judgement of guilt. So from the anatomy lesson above we understand that the mouth has a hidden component called the heart that really controls all of our words. With that being said, taking a fast from negative words is not merely a physical exercise of controlling the motion of our mouth, but rather tending to the condition of our hearts. So just how do we tend to our hearts? We will tackle that in future post. Give us your comments. Click here: Growing in Gratitude. for a free download of a great 30 day devotional that is pointing you towards gratitude. Join in as we fast from negative words for 30 days. I wrote 15 viable reasons to join this campaign in a previous post. Entire churches are joining, small groups, families, teams, etc. are all joining in. This campaign will change your life! It is the right thing to do.